Martin Hügi is a Professional Consulting Arborist holding the Arboricultural Associations "Technicians Certificate in Arboriculture" (TechArborA). Martin holds additonal qualifications in "Professional Tree Inspection" and "Risk Assessment for Commercial Arboriculture" both run by the Arboricultural Association. Martin worked as a manager within a large Arboricultural and Ecological Consultancy, Landscape Planning Group Ltd in Colchester, he now continues to work for them as a Freelance Consulting Arborist and also for other Professional and Private Clients. Martin has worked for more than twelve years in the tree industry and as well as holding professional tree surveying qualifications continues to work 'on the tools' climbing and felling trees regularly. This gives Martin an emperical working knowledge of trees, their species, their safety and the effect of diseases that can only be gained from direct experience. Martin is therefore well placed to undertake large and small Tree Surveys to aid tree owners in meeting their legal requirements as well as providing timely advice, work planning and damage assessment. This web page has been compiled to help tree owners understand the law as it relates to trees and their safety. It will explain what the legal requirements are, and what is legally expected of tree owners. The web page is primarily aimed at those with large tree stocks, but equally also applies to those who may only own a single tree. Below we attempt to introduced the principle statutory and common laws of England in regards to trees, and introduce the important legal terms that shape the tree inspection decision making process. Although this advice sheet goes in to some depth to explain the process of tree inspection and the evaluation of risk, it is also intended to demonstrate how simple and easy it can be to meet the legal requirements. An inspection management system, once it has been set up with certain procedures followed and adequate records kept, becomes quicker and easier for on-going future assessment. 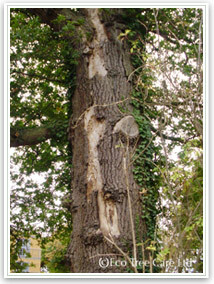 Where a tree is hazardous because of decay or structural weakness and shows external signs of being in such a condition, the occupier of the land on which it stands is normally liable under UK laws for any personal injury or other damage it causes by breaking or falling. This liability arises from provisions by which the occupier has a common duty of care to others who enter the land or its vicinity. The occupier is defined as the person ‘occupying or having control of the premises’, and this effectively means whoever has possession of and controls the land. In England and Wales, liability is governed by the Occupiers’ Liability Act (1957) and (1984). The earlier Act deals with liability relating to visitors; i.e. persons who enter land or premises either by invitation or by permission. The later Act deals with liability relating to other persons, including trespassers and it should thus be noted that owners can be held negligent in their duty of care even if injury or damage occurs on land where people do not have access by right or by invitation. sustained by uninvited or unauthorised visitors, such cases are most likely to arise when there are insufficient signs and/or barriers to indicate clearly that public access is not permitted. It should, however, be noted that, within the provisions of the above Acts, the Courts expect occupiers to be prepared for children to behave less carefully than adults; for example, by climbing trees which may have weak branches. It is especially important to consider this when designing and managing sites such as recognised play areas, where parents can reasonably expect children to play unaccompanied. The Courts expect occupiers to make regular inspections of trees that, by reason of their position, could place people or property at risk. It is also expected that they should, if necessary, obtain specialist guidance on the interpretation of symptoms and assessment of tree safety and to take reasonable steps to reduce risk where appropriate. If specialist advice is sought, it should be followed: failure to do so could be interpreted as negligence. What is its likelihood of it occurring? What is the likely consequence of its occurrence? Is it reasonable to protect against it? Statute law does not require the tree owner to maintain completely safe trees and it is also true to say that safe trees do not exist. 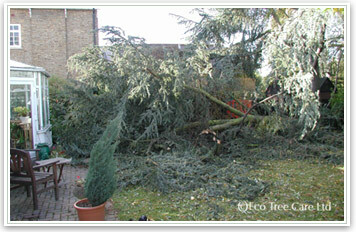 However the Duty of Care requires the tree owner "to take reasonable care." 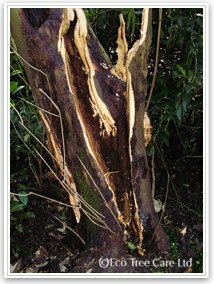 The act of a tree, or part of a tree, causing injury to persons is likely to give rise to litigation. This may take the form of a claim either in negligence or, where the injury to the person is on the same land as the tree, under the Occupiers Liability Acts 1957 and 1984. The basic principle underlying both the law of negligence in common law and the Occupiers Liability Acts is that the owner of the land and trees owes a duty to take reasonable care to protect those reasonably likely to be affected. As a result, the tree owner or those responsible for them must take steps to ensure that they are aware of whether a tree is likely to cause problems and, if it is, should take appropriate avoiding action as necessary to protect those who are "reasonably" likely to be adversely affected. Statute law does not require the tree owner to maintain completely safe trees, and it is certainly not practical or possible to inspect each tree on a daily basis. The duty only requires the tree owner and those responsible for them "to take reasonable care". The term ‘Reasonable’, ‘Reasonably’ and 'Foreseeable' occur over and over again. As long as the tree owner can demonstrate that they have taken steps to inspect their trees for safety on a regular basis and taken adequate action where necessary then they have fulfilled their duty of care. Taking adequate action may mean employing a qualified and trained tree inspector where there is any doubt on a tree or trees condition. If a tree owner has a system of tree inspection and understands when to escalate the expertise that may be required then they are unlikely to be found to be negligent even if harm does occur. Negligence, in the eyes of the law, is not doing something. ‘Foreseeable’ is another important term that ties in directly with the terms above. Negligence would be omitting to recognise a hazard that was foreseeable. This applies to any hazard not just trees. By undertaking systematic and regular tree inspections the aim is to pre-empt foreseeable problems and to spot the dangerous trees before accidents happen. "although the benefits from trees generally outweigh the risks very greatly, there are particular cases where individual trees, by virtue of their condition and location, pose an unacceptable risk to people or property". It is these trees that need to be identified by inspection and surveying, and action taken. Tree owners in order to fulfil their statutory and duty of care requirements should have a system of tree inspection in place. 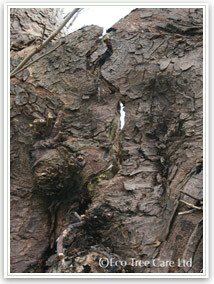 An initial tree survey will locate, identify and assess each tree. This will provide a framework upon which further tree inspections can be based. 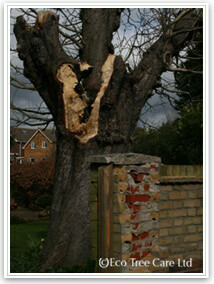 This should be carried out by an arboriculturalist trained to a professional standard in tree inspection. To be able to clearly and competently identify when a tree has a defect likely to cause injury and to be able to specify the necessary avoiding action requires experience and specific training. 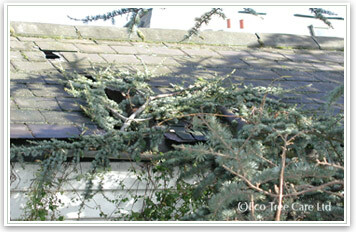 A professional tree inspection is a systematic and thorough visual inspection from ground level. A number of non-invasive tools can be used to assess the integrity and safety of the tree. Any defects found are quantified and recorded with their locations on the tree and photos may be taken. This gives future inspections a reference point to be able to assess whether defects are progressing and if so at what rate. A note of fungal brackets, if present at the time or if they are perennial, will be made. Their identification and significance will also be picked up during a professional tree inspection. If the tree stock is large then some owners of trees may have competent employed staff capable of carrying out basic tree inspection from ground level at regular intervals. A professional arboriculturalist can then be brought in if the basic in-house inspections discover an obvious defect that is new or worsening from the previous inspection. There are also some fungi that effect trees that fruit annually and only appear at certain times of the year, these may be spotted during regular basic inspections and an arboriculturalist can then be consulted as to its significance. With in-house basic tree inspection it means that a professional arboriculturalist can be employed less frequently to carry out generic full inspections and/or as deemed necessary as explained above. The other times when it may be necessary to use a trained arboriculturalist are after severe storm events that may have caused sudden changes or damage or when there is a change in use or activity in and around trees that may increase the risk posed. This systematic approach should mean that all foreseeable defects are recognised and dealt with before any injury or damage occurs. The tree owner has acted reasonably. Whether in-house inspection or inspection by an arboriculturalist, the important point is that a written record is kept of the inspection and the findings. 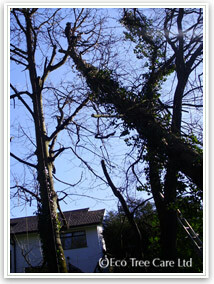 As part of a professional tree inspection the hazards and risks, if any, are identified and assessed. If necessary, remedial recommendations are given. A re-inspection frequency is also recommended. The following definitions are used to evaluate risk and to determine the inspection frequency. Hazard - Something with the potential to cause harm e.g. a tree with a recognised defect. Risk - The probability that harm will actually be caused to persons or property by the tree with a defect. Target - In order for there to be a risk there has to be a target; people and property constitute a target. Where no property exists or no people can go, there can be no target: therefore, no risk. The report produced by the tree inspector should clearly state the risks found and recommend actions to manage that risk. Trees are valuable assets to both wildlife and to our aesthetic experience of our environment. They provide shelter & shade and add a sense of proportion to the areas in which we live and work. 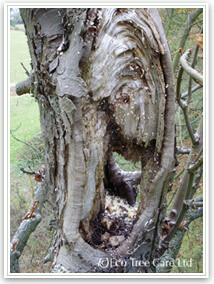 Defects in trees very often provide homes to our native wildlife. In managing tree stocks it is important that these factors are not overlooked. A professional tree inspection will also point out if wildlife habitat is present or likely to be present. Certain species that use trees are heavily protected under wildlife legislation, most notably bats. Also protected are nesting birds. The first consideration, in an urban setting, is to the safety of people and property within and around trees, especially where there is a clear duty of care. Eco Tree Care’s tree inspections and recommendations will reflect this, however consideration will also be given to the wildlife value and amenity value of the tree and suitable recommendations given, where possible, to mitigate the effect on wildlife and amenity. It should be pointed out that the dangers of trees are considerably overestimated. The chances of being killed by a tree in a public space, in the UK, is about 1 in 20,000,000 (according to the HSE's draft Sector Information Minute). The total number of accidental deaths in the UK is over 12,000 per year. About 6 of these are due to trees. Therefore it is 2000 times more likely that death will occur from some other type of accident than by being hit by a falling tree. More specifically, 3,501 people were killed in road traffic accidents in the UK in 2005 which is 1 in 16,800. So the chances are 600 times more likely to be killed in a road accident than by a falling tree. 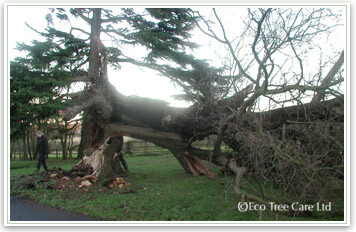 Trees often fail during storms and high winds, which is also the time when people are inside buildings rather than outside. When tree-related accidental deaths do occur they are newsworthy and are often reported. Therefore it is easy to get a sense that trees are more dangerous than they actually are. Trees are a valuable asset both visually and environmentally. A well managed tree stock will help to ensure the continuity of trees in the areas where we live and work. Tree inspections provide the basis for good tree management and if done in a professional, systematic and regular manner also can help to satisfy the legal requirements under English law. Ultimately regular inspections will give a much greater degree of safety to people and property around the trees than would have otherwise been the case. Martin Hügi, managing director of Eco Tree Care & Conservation Ltd, is an experienced and qualified Arborist. He has been climbing trees and carrying out tree surgery for a decade, always with a view to treating the tree as a living organism and considering the needs of it’s position. The ethos of the company is to only carry out work that is absolutely necessary, looking to maintain healthy and safe trees. This is contrary to some other tree surgery companies who quote to carry out unnecessary work to generate more profit, invariably this is of a poor quality and can terminally damage previously healthy trees. Martin Hügi is a qualified arborist with a Technicians Certificate in Arboriculture and is further specifically trained and qualified in professional tree inspection and report writing. Having years of experience of climbing trees gives him an important feel for the stresses and strains inherent in the structure of trees and a knowledge of different tree species and their characteristic strengths and weaknesses. Knowing how trees respond to pruning and how to correctly carry out such work means that proper recommendations can be given. · Barrell, J (2003). Tree Assessment on Development Sites. The future of the profession in the balance. EssentialARB Issue 8, 6-10. · British Standards Institution (1989). BS3998 Recommendations for Tree Work. Stationery office, London. · British Standards Institution (1991). BS5837 Guide for Trees in Relation to Construction. Stationery office, London. · Davis, C. Fay, N. & Mynors, C (2000). Veteran Trees: a guide to risk and liability. English Nature, Peterborough. · DOE (1994). Planning Policy Guidance Note 9 (PPG 9), Nature Conservation, Stationery office London. · E.E.C. (1992). Council Directive 92/43/EEC on the Conservation of Natural Habitats and of Wild Fauna and Flora. · Erb M., L. Wessolly (1998).Handbuch der Baumstatik und Baumkontrolle. Patzer Verlag. · Fay, N. & De Berker, N. (1997). 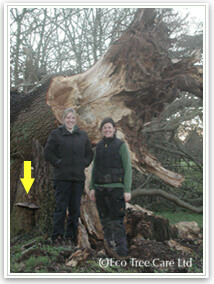 Veteran Trees Initiative: Specialist Survey Method. English Nature, Peterborough. · Helliwell, D. R. (1996). The nature of consultancy work. Arboricultural Journal 20, 179-183. · Helliwell, D. R. (2001). 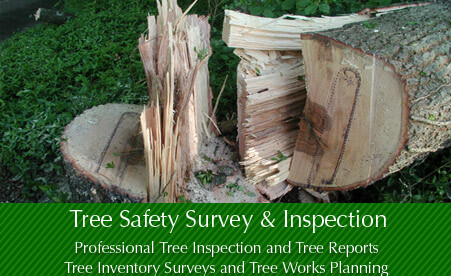 Tree survey and inspection: scope and presentation. Arboricultural Journal 25, 339-352. · HMSO (1957). Occupiers Liability Act 1957 and 1984. Stationery office, London. · HMSO (1981). Statutory Instrument No. 878. The Wildlife and Countryside Act 1981 (as amended); Section 1. · HMSO (1997). Statutory Instrument 1997 No. 1160, The Hedgerow Regulations, London. · HMSO (1997). Statutory Instrument No. 3055. The Conservation (Natural Habitats, &c.) (Amendment) Regulations 1997. · HMSO (2000). Statutory Instrument 2001 No. 114 (C.4). The Countryside and Rights of Way Act. Stationery office, London. · Lonsdale, D. (1999). Principles of Tree Hazard Assessment & Management, Research for Amenity Trees No. 7, Stationery office, London. · Lonsdale, D. (1994) The role of tree mechanics in hazard tree evaluation. Arboricultural Advisory and Information Service Arboriculture Research and Information Note 127/94/PATH. · Mattheck, C. & Breloer, H. (1994). The Body Language of Trees, Research for Amenity Trees No. 4, Stationery office, London. · Mattheck, C. & Kubler, H. (1995). Wood - The Internal Optimization of Trees, Springer - Verlag, Berlin Heidelberg New York. · Mynors, C. (2002). The law of trees, forests and hedgerows. London: Sweet & Maxwell. · Schwarze, F.W.M.R, Engels, J. & Mattheck, M. (2000). 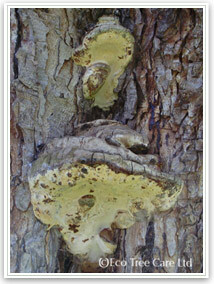 Fungal Strategies of Decay in Trees. Springer, 185pp. · Strouts, R.G. & Winter, T.G. (1994). 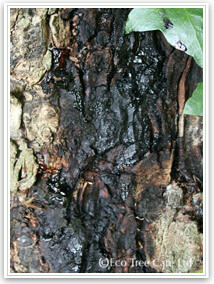 Diagnosis of Ill-Health in Trees, Research for Amenity Trees No. 2, Stationery office, London. · UK Biodiversity Group (1998). UK Biodiversity Group Tranche 2 Action Plans - Volume II: Terrestrial and freshwater habitats. Species and habitat action plans. English Nature, Peterborough. · Bethge, K., Mattheck, C. and Hunger, E. (1996). Equipment for detection and evaluation of incipient decay in trees. ArboriculturalJournal, 20 (1) 13-37. · Bethge, K., Mattheck, C. (1998). Mechanical survival strategy of trees. ArboriculturalJournal, 22 (4): 369-386. · Bethge, K., Mattheck, C. and Albrecht. W. (1997) How to read the results of resistograph. Arboricultural Journal, 21(4): 331-346. · Dolwin, J., Lonsdale, D. and Barnett, E. (1999). Detection of decay in trees. ArboriculturalJournal, 23(2): 139-149. · Dolwin, J. (1996). 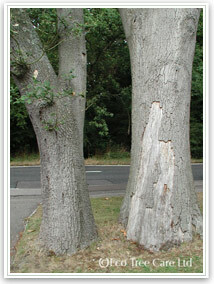 Evaluation of internal defects in trees and the legal implications. Arboricultural Journal, 20(2): 173-178. · Habermehl, A. & Ridder, H-W. (1995). Computerised tomographic investigations of street and park trees, Arboricultural Journal, 19(4): 419-437. · Moore, W. (1999). The combined use of resistograph and the shigometer for the accurate mapping and diagnosis of internal condition of woody support organs. Arboricultural Journal, 23(3): 273-287. · Ouis, D. (2001). Detection of rot in standing trees by means of an acoustic technique. Arboricultural Journal, 25(2): 117-152. · Ouis, D. (2003). Non-destructive techniques for detecting decay in standing trees. Arboricultural Journal, 27(2): 159-177.